Hi all and welcome to the Who's That Girl Hop! If you just happened upon the hop, please go back and start at the beginning HERE so you don't miss anything. We are featuring the new stamp set, Maid for Who's That Girl, which is part of the MFT VIP collection available NOW, right HERE! It is a collection of products that will not be released for another two weeks, but you can get yours NOW. Hurry... there are only 45 collections available! Me: Look honey at this card I made for the blog hop! I stamped the image with black memento ink and colored it with Copic markers. I paper pieced the chair with some patterned paper from SU. I went over the "carpet" with my colorless blender so that it would become kinda splotchy and give it more a textured feel. It is carpet after all... :) The sentiment was stamped and quickly embossed with clear embossing powder to make it pop off the patterned paper better. I added Sakura clear glaze pen over the head of the vacuum and her glass of wine to give it a more realistic feel. Stamps: Maid for Who's That Girl? What a sharp card! Love your yummy colours! GORGEOUS! Every household should have a *pink* vacuum! Love your layout, with that mega curved rectangle behind the image! Perfect Jody, I love your stitches. Sooo NOT lame! :) You know I adore this color combo, and I love the way you framed the image. Perfection, as usual! (((Jody))) And I'll call you back tomorrow (it was the director of Carter's school that was calling when we were talking earlier... nothing bad, don't worry! ;) ) -- I promise! Love the pink vacuum! I think this card would make most woman smile! Love the colours and composition - fab job! This is beautiful! I WANT a pink vacuum!!!! Be sure to leave the vacuum in a strategic spot for Frank! LOL! awesome! 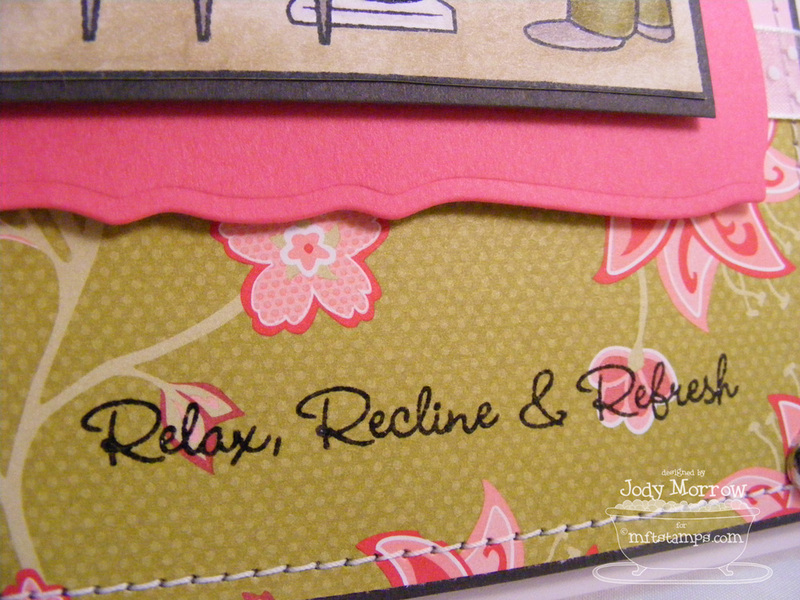 great use of those papers, love the layout. NICE work, Jody! HEHE if I had a pink vacuum the Mr would never vacuum again. I love it Jody. Jody, I love this!! I might even vacuum a bit if *I* had a pink vacuum, LOL! Totally FUN! This is a great card and it made me smile! Gorgeous! Great card, Jody! I love reading your little convos w/ your hubby! love the glass on the card. Great job. This is GORGEOUS Jody!!! 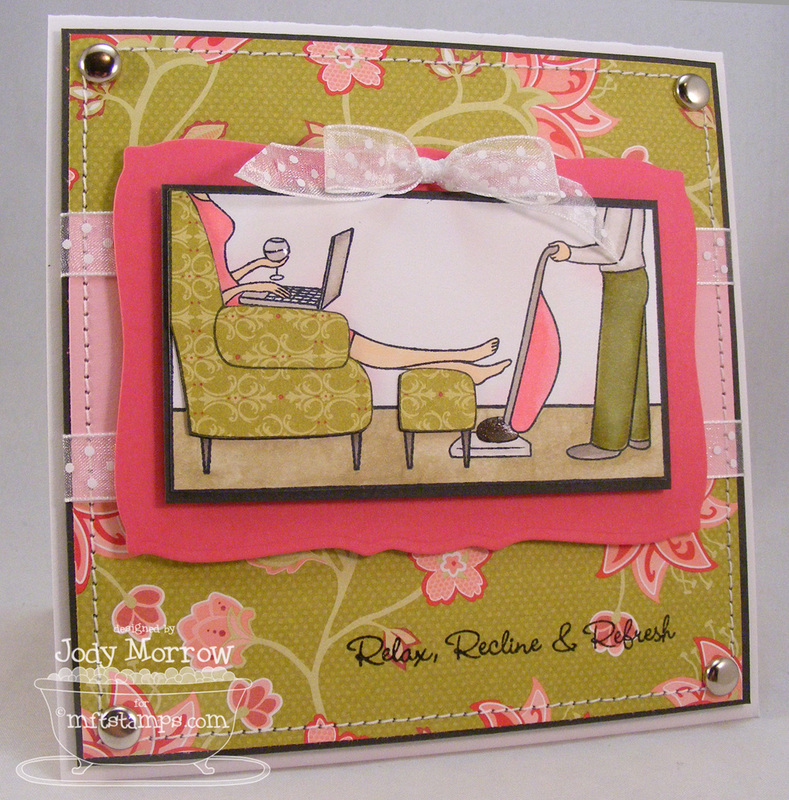 I LOVE the pink vacuum and the pretty tapestry chair! Love the card and I REALLY like how you used the Rasp Tart paper, that is one side I couldn't figure out.... Looks great!!! Oh I love this!! Wonderful job on all the paper piecing!! Beautiful and this set looks awesome!! 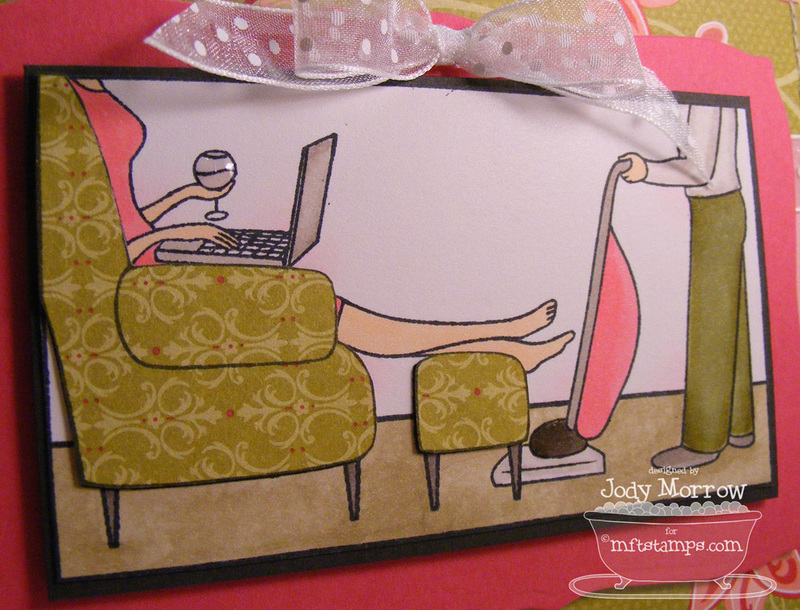 Fabulous card Jody! 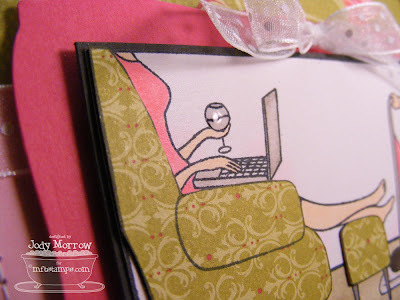 That paper is just perfect for a chair and ottoman! Love the pink vacuum! Fantastic card! 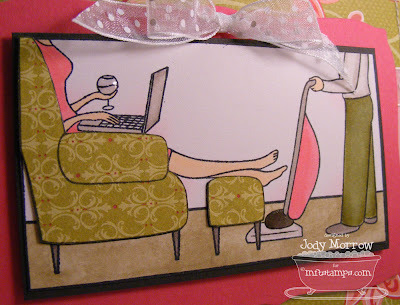 This card is so ME! I have a back problem and cannot use the vacuum - Thanksgiving day, my hubby was vacuuming and I was checking my e-mails on my laptop in my recliner with a cup of coffee! Gotta love this stamp!